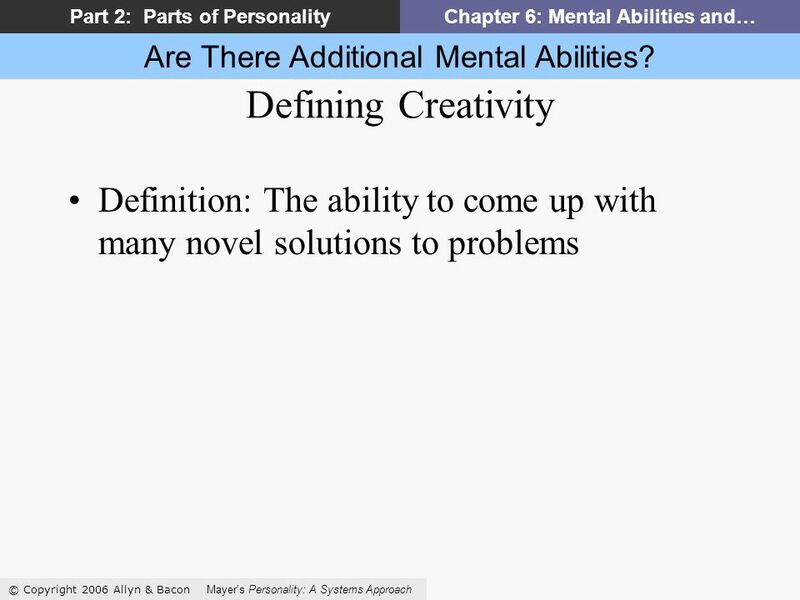 Getting Started Copyright © 2007 Allyn & Bacon Mayers Personality: A Systems Approach Part 2: Parts of PersonalityChapter 6: Mental Abilities and… Mental. 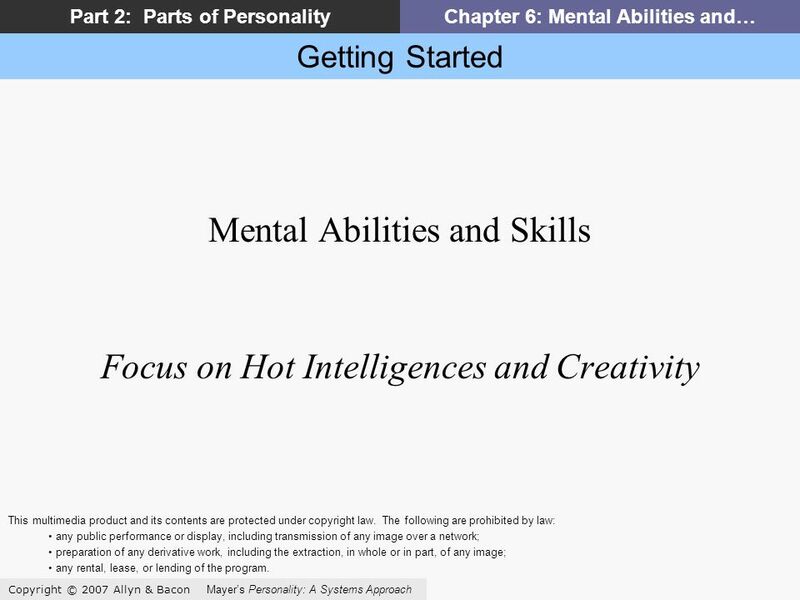 1 Getting Started Copyright © 2007 Allyn & Bacon Mayers Personality: A Systems Approach Part 2: Parts of PersonalityChapter 6: Mental Abilities and… Mental Abilities and Skills Focus on Hot Intelligences and Creativity This multimedia product and its contents are protected under copyright law. The following are prohibited by law: any public performance or display, including transmission of any image over a network; preparation of any derivative work, including the extraction, in whole or in part, of any image; any rental, lease, or lending of the program. 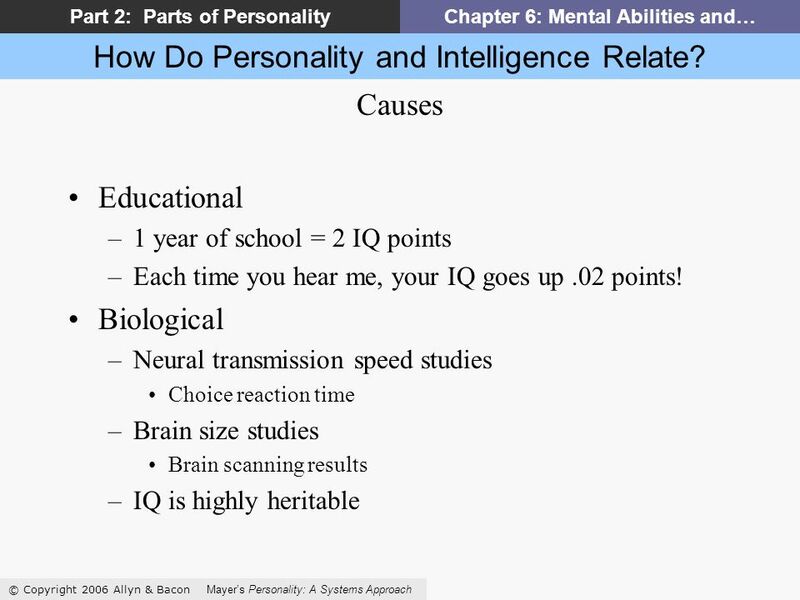 6 Are There Additional Mental Abilities? 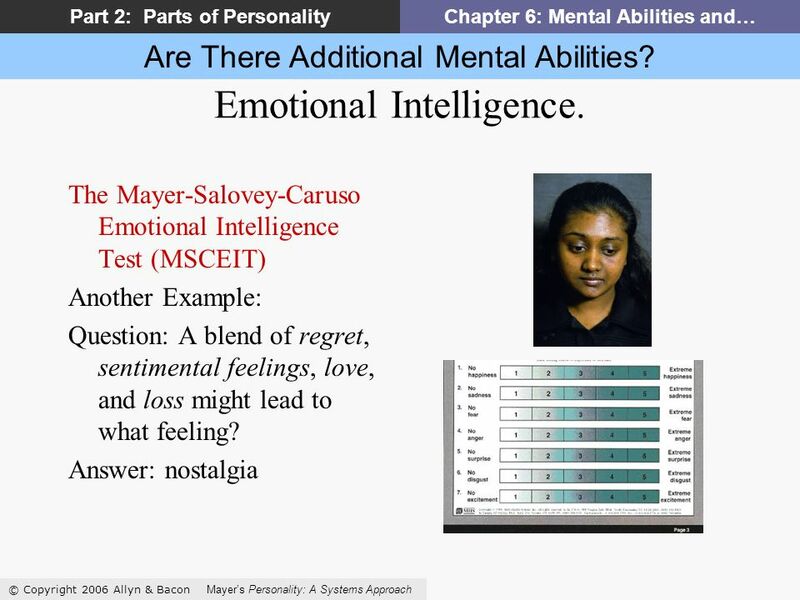 © Copyright 2006 Allyn & Bacon Mayers Personality: A Systems Approach Part 2: Parts of PersonalityChapter 6: Mental Abilities and… Emotional Intelligence. Emotions Are Signals about Relationships and Related Actions Each emotion means something and operates in a particular way. 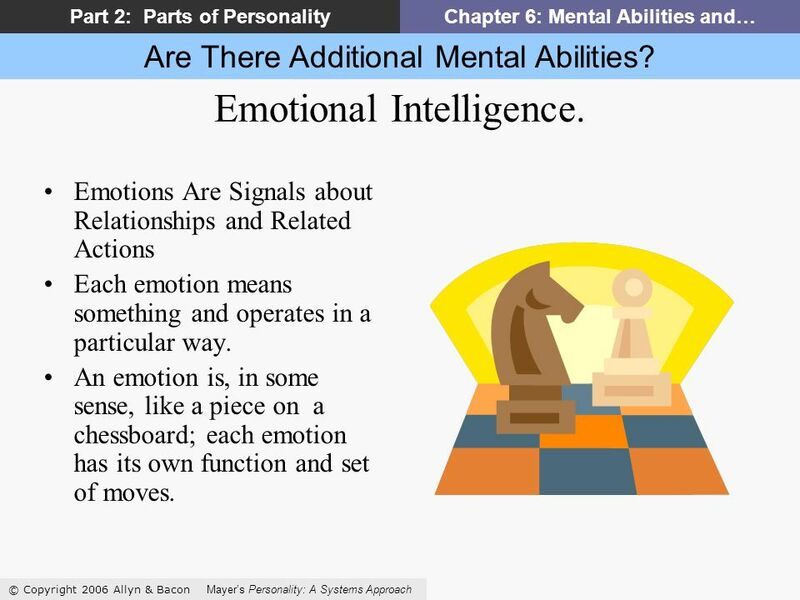 An emotion is, in some sense, like a piece on a chessboard; each emotion has its own function and set of moves. 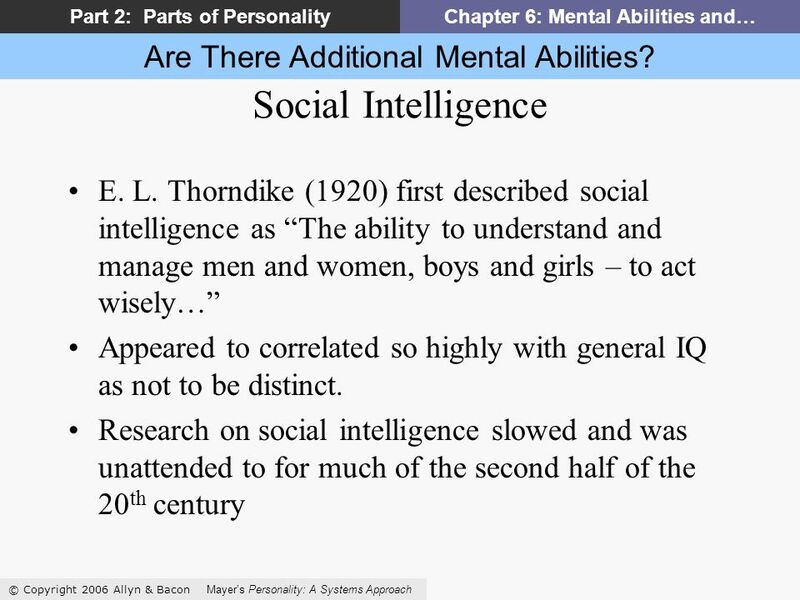 11 Are There Additional Mental Abilities? 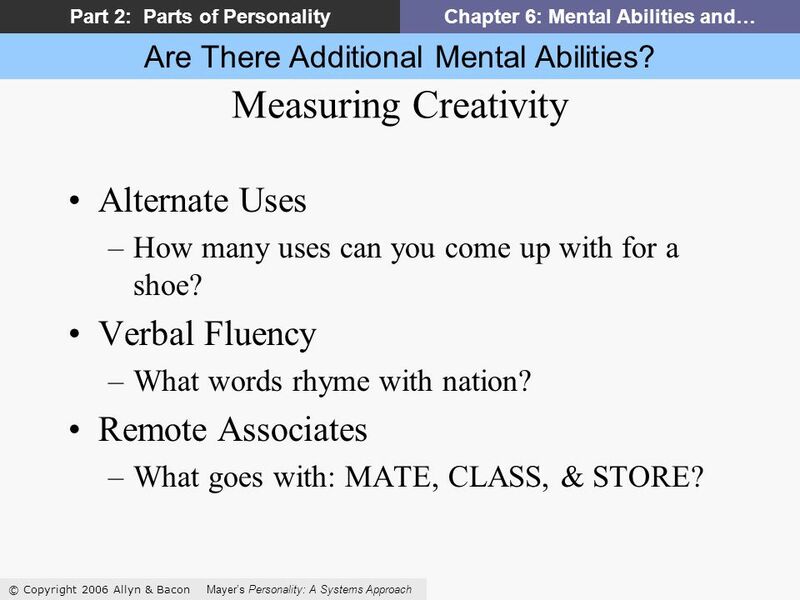 © Copyright 2006 Allyn & Bacon Mayers Personality: A Systems Approach Part 2: Parts of PersonalityChapter 6: Mental Abilities and… Measuring Creativity Alternate Uses –How many uses can you come up with for a shoe? Verbal Fluency –What words rhyme with nation? Remote Associates –What goes with: MATE, CLASS, & STORE? 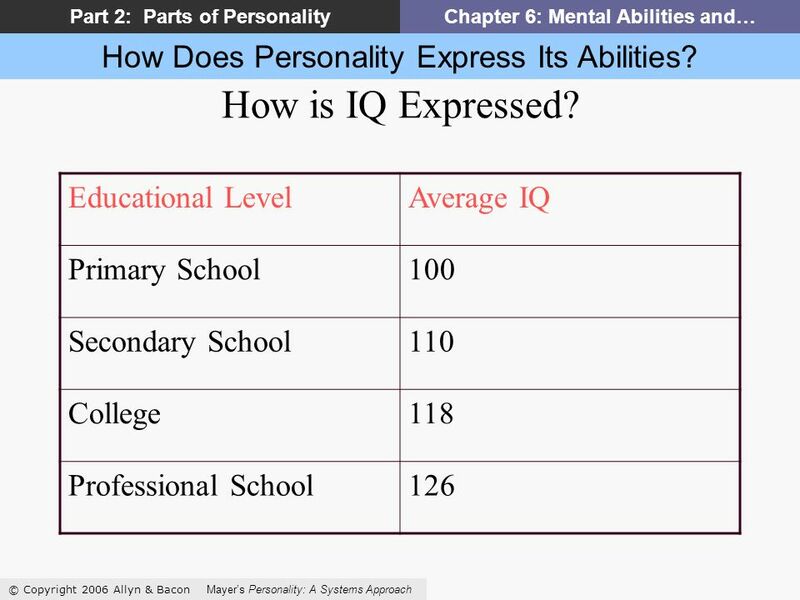 Download ppt "Getting Started Copyright © 2007 Allyn & Bacon Mayers Personality: A Systems Approach Part 2: Parts of PersonalityChapter 6: Mental Abilities and… Mental." 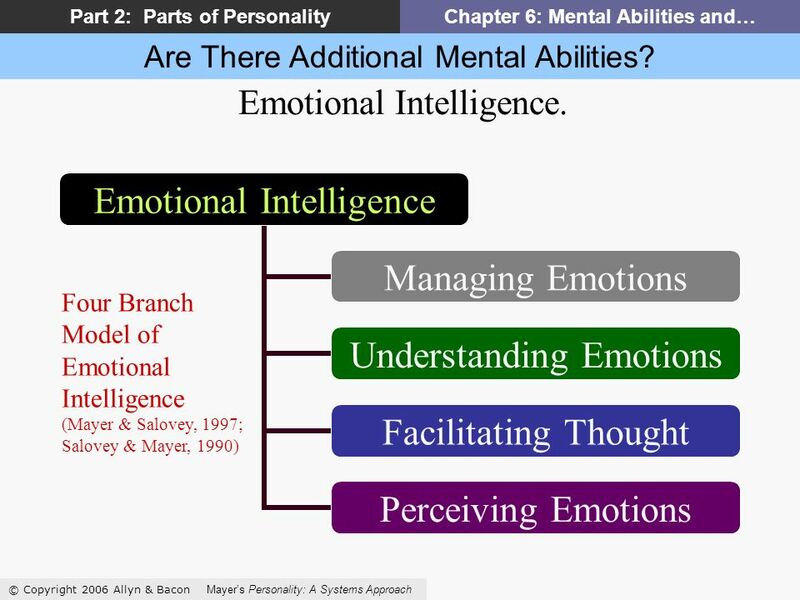 Getting Started Copyright © 2007 Allyn & Bacon Mayers Personality: A Systems Approach Part 2: Parts of PersonalityChapter 4: Motivation and Emotion Motivation. Getting Started Copyright © 2007 Allyn & Bacon Mayers Personality: A Systems Approach PART 1: EXPLORING PERSONALITYCHAPTER 2: RESEARCH IN PERSONALITY Research. 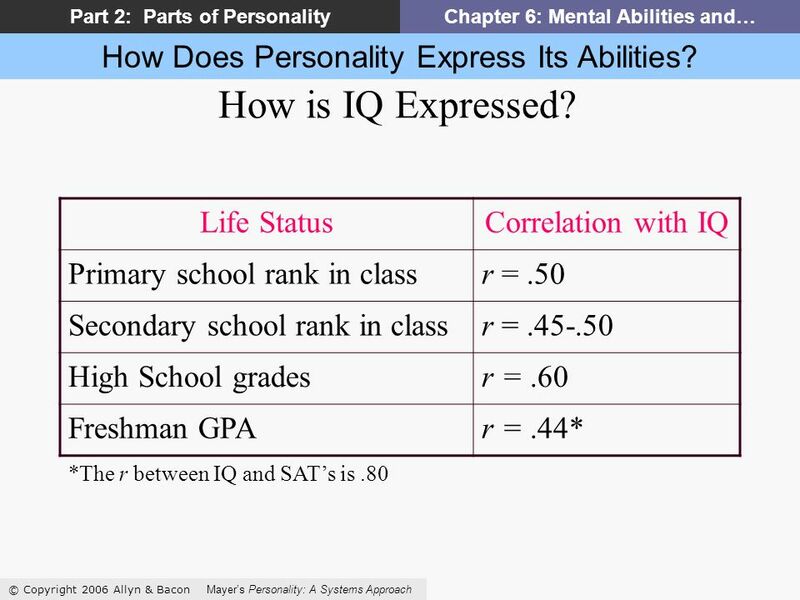 Look Smart © Copyright 2006 Allyn & Bacon Mayers Personality: A Systems Approach Part 2: Parts of PersonalityChapter 6: Mental Abilities and… Look Smart. 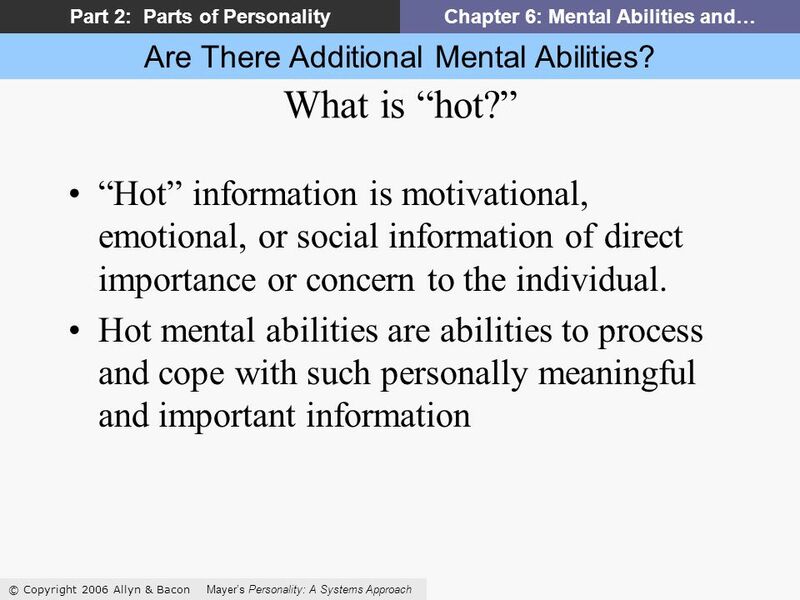 PART 3: PERSONALITY ORGANIZATIONCHAPTER 9: DYNAMICS OF ACTION Focus on Igniting Motives Copyright © 2007 Allyn & Bacon Mayers Personality: A Systems Approach. Chapter 4: Problem Identification and Hypothesis Formation This multimedia product and its contents are protected under copyright law. The following are. 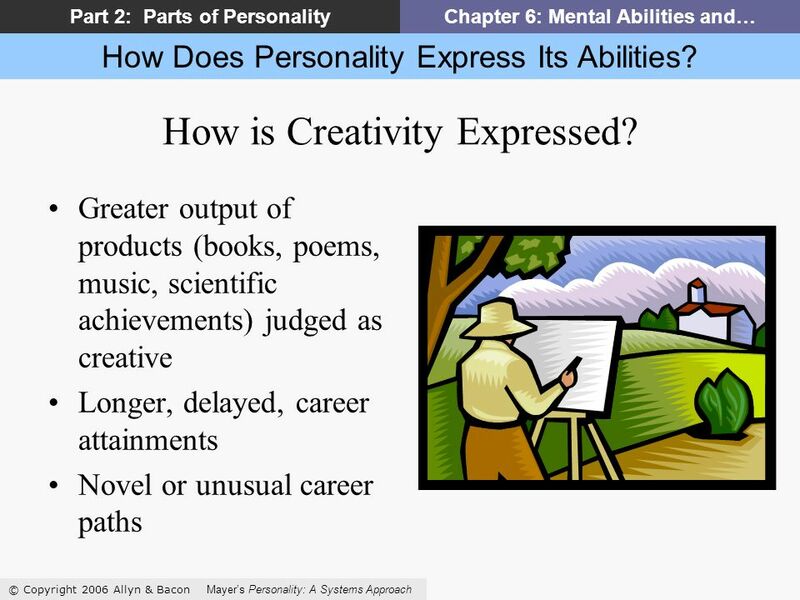 Getting Started Copyright © 2007 Allyn & Bacon Mayer’s Personality: A Systems Approach Part 2: Parts of PersonalityChapter 4: Motivation and Emotion Motivation. 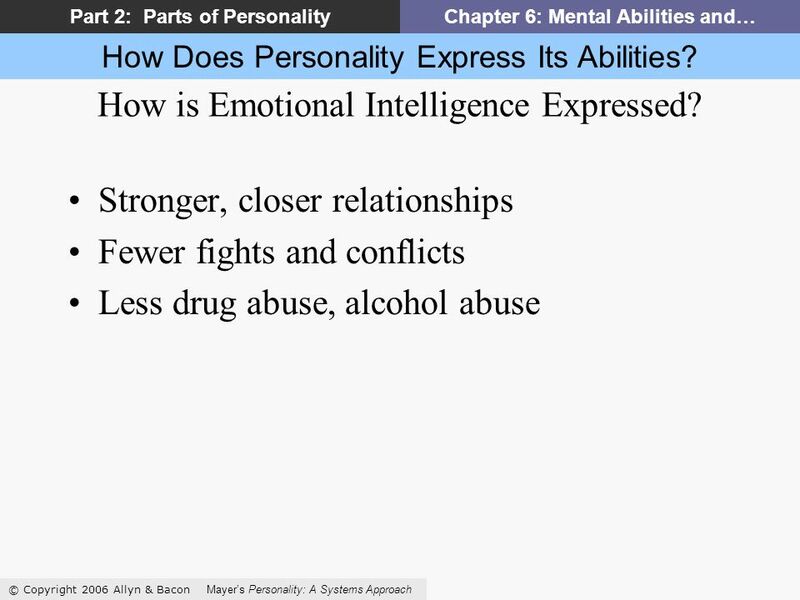 Copyright © 2007 Allyn & Bacon Mayer’s Personality: A Systems Approach Part 2: Parts of PersonalityChapter 6: Mental Abilities and… Mental Abilities and. Copyright © Allyn & Bacon 2004 Development Through the Lifespan Chapter 5 Cognitive Development in Infancy and Toddlerhood This multimedia product and. 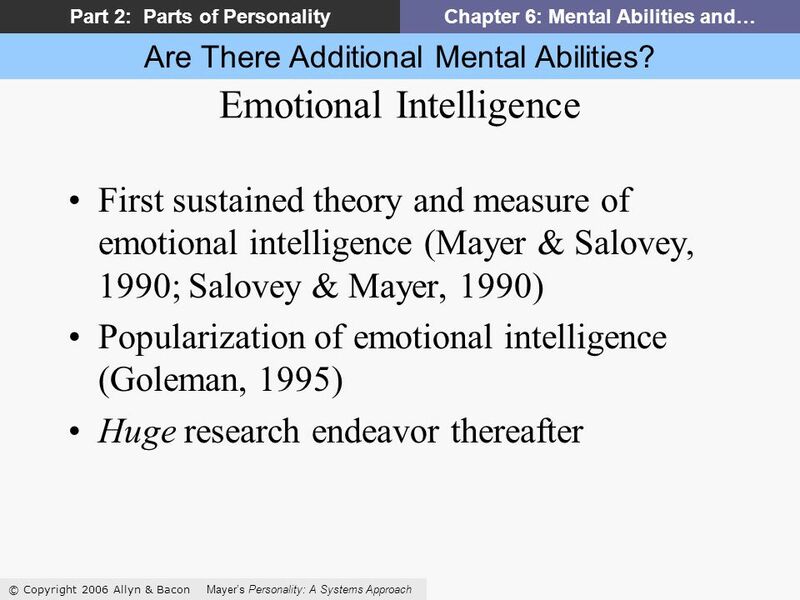 Copyright © 2006 by Allyn and Bacon Chapter 1 Biopsychology as a Neuroscience What is Biopsychology, Anyway? This multimedia product and its contents are. Copyright © Allyn & Bacon 2008 Using Technology in the Classroom Gary G. Bitter & Jane M. Legacy Chapter Four This multimedia product and its contents. Chapter 5 Listening and Responding This multimedia product and its contents are protected under copyright law. The following are prohibited by law: Any. 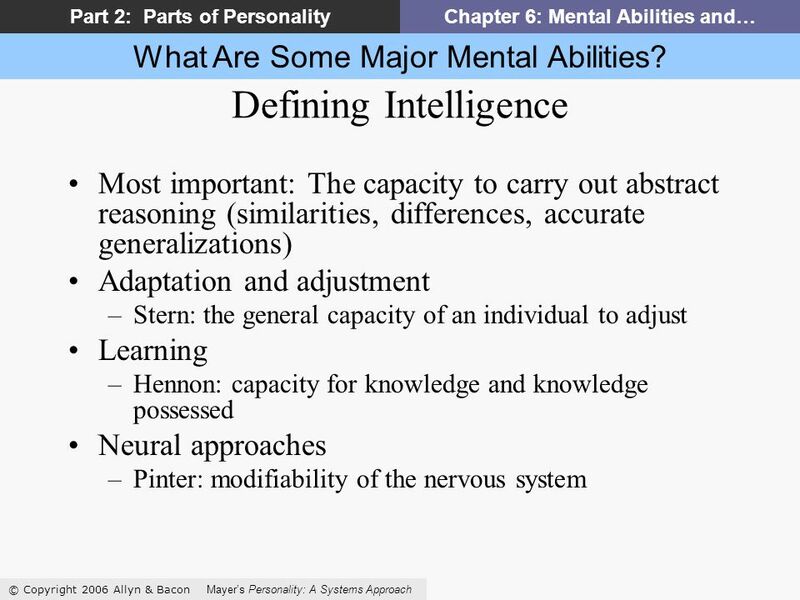 Getting Started Copyright © 2007 Allyn & Bacon Mayer’s Personality: A Systems Approach Part 2: Parts of PersonalityChapter 6: Mental Abilities and… Mental.